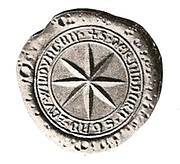 ‘Villa Wildungun’ is first documented in Hersfeld Monastery’s goods directory. The village was located to the east of the town in the Wilde valley. Count Friedrich, a descendant of the Thuringian landgraves, orders the construction of fortified dwellings high above the Wilde valley. This was the precursor for the castle and Alt (from the Latin altus), or ‘Upper’ Wildungen, which would later come under the control of the Count of Waldeck. Is reported to be the year in which the town of Nieder-Wildungen, or ‘Lower Wildungen,’ was founded by the Thuringian-Hessian landgrave on the hill facing the fortified dwellings. First mention of a church. First mention of a town hall. First mention of a cemetery in Wildungen. The town comes under the control of the Count of Waldeck and becomes a prosperous community. Construction of today’s church begins. It takes until 1489 to complete the steeple. ‘Lower’ and ‘Upper’ Wildungen are separated. 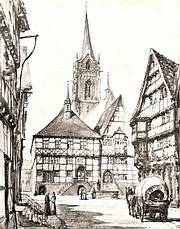 The ‘two towns of Wildungen’ are first mentioned in 1358. A severe plague epidemic devastates Lower Wildungen. The ‘Hospital’ is founded between the two towns. Count Heinrich V. hands control of the Hospital to the Knights Hospitallers of Wisenfeld. Hermann Smenkys (Schminke) channels water from the "Sauerbrunnen" mineral springs into the town. 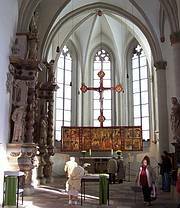 The altar of Conrad of Soest is put into place in the church. The first craft guilds are formed. Construction of the town hall in Lower Wildungen. Kaiser Maximilian grants Count Philipp of Waldeck possession of the Sauerbrunnen mineral springs. Count Philipp IV. and Johannes Hefenträger establish the Reformation in Wildungen. First witch trial in Lower Wildungen. More than 400 people die as a result of a plague epidemic. A cemetery is constructed by the Reitzenhagener Tor, known later as Lindentor. Construction of the Weinschänke, or ‘wine tavern,’ next to the town hall. Veit Weinberg composes his rhyme chronicle of the town of Wildungen. Further witch trials in Wildungen. Erection of a monument in the church in memory of Count Samuel. Comital mint in Lower Wildungen. Wildungen influenced by the Thirty Years’ War. Imperial, Hessian, Swedish and French forces are billeted in the town. Pillaging and destruction occur in the town. Swedish troops under the command of General Baner dig in near Wildungen. They are faced by Imperial troops based near the town of Fritzlar. The confrontation lasts for six weeks, leaving ravaged towns and villages in its wake. Final witch trials in Lower Wildungen. 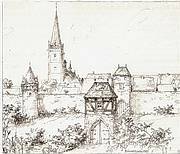 Count Josias orders the construction of the castle in Upper Wildungen to begin. In 1647, a monument is erected in the church in memory of the count who was killed in action in Crete. The Salzborn springs (known today as Helenenquelle) are tapped for the first time. The first public facility (referred to as ‘Schuppen,’ or ‘Shed’) is constructed next to the Stadtbrunnen springs (known today as Georg-Viktor-Quelle). It stands until 1884 when it is demolished. Prince Friedrich Anton Ulrich orders the construction of Castle ‘Friedrichstein’ in Upper Wildungen. Construction of the church in Upper Wildungen. Erection of a monument in the church in memory of Prince Carl. The first hotel and bath house is constructed near the springs. Despite a great deal of effort, the number of spa guests declines steadily. A constitution is passed in Lower Wildungen. Demolition of the Brunnen, Wegaer and Linden gates. Wildungen Mineral Springs Corporation is founded. The spa resort begins to prosper once again. Dr. Carl Rörig discovers the ‘Königsquelle’ springs. The opening of a railway line between Wabern and Lower Wildungen connects the town with the Main-Weser line. Guest numbers continue to increase along with economic growth. Gustav Görner, a spa guest from Zittau, discovers a natural spring in a meadow near Reinhardshausen. He buys the land and begins the ‘Reinhardsquelle’ spa resort which soon flourishes. The Princely Wildungen Mineral Springs Corporation manages the spa resort. The railway line is extended from Bad Wildungen to Buhlen, Waldeck and Korbach. In 1917, the line is extended further to link Brilon-Wald in the uplands. Construction of the synagogue which is one of the largest and most beautiful in any of the small towns in Germany. It is located at Dürren Hagen and becomes as much a part of the townscape as the church, Castle Friedrichstein and the Rote Hahn. The new pump room is constructed at the Georg-Viktor springs. Waldeck is annexed by Prussia. Bad Wildungen comes under the control of the Prussian state. The July Reichstag elections are still free and 51.2% of Wildungen residents vote for the Nazi Party. 144 Jews reside in Bad Wildungen. By 1937, 36 have emigrated or have dispersed throughout Germany. 34 year-old Rudolf Sempf becomes mayor. He is the leader of the northern section of the Nazi Party, district head of the Kassel region and a party propagandist. The synagogue is destroyed and all male Jews are arrested and transported to Buchenwald via Kassel. A total of 80 Wildungen Jews manage to emigrate and the final 40 are interned in concentration camps by 1942. Just 3 of them survive the Holocaust. Construction of Bunker 17 for the Luftwaffe High Command, billeted in the nearby Fürstenhof. Bad Wildungen becomes the Prussian State Bath. The State of Hessen takes control after the Second World War. The neighbouring communities of Upper Wildungen, Reitzenhagen and Reinhardshausen are incorporated. 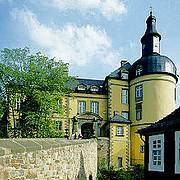 The Nazi Party takes control of Castle Friedrichstein which then becomes the Nazi district headquarters. American troops liberate Bad Wildungen from the Nazis. The Fürstenhof hotel is used by the Americans until 1958. The settlements of Albertshausen, Armsfeld, Bergfreiheit, Braunau, Frebershausen, Hüddingen, Hundsdorf, Mandern, Odershausen and Wega are incorporated as part of the administrative reform. The BKW (Bad Wildungen Transport and Water Supply Corporation) is founded. Bypass provides relief from traffic within the town. 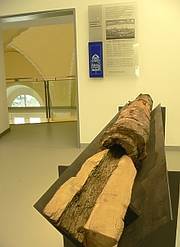 Completion of the museum in Castle Friedrichstein. Implementation of a pedestrian zone in the Brunnenstrasse. Renovation of the Old Town begins. Inauguration of the new spa hotel, transformation of the Brunnenallee, renovation and extension of the town hall. The ‘Kurschatten,’ (spa shadow) springs attract a lot of media attention. The spa museum opens at Brunnenallee 1 with exhibitions on town and spa history. Bad Wildungen celebrates the 750th anniversary of the town charter with 5 months of events and a vibrant festival week in September. A casino is reopened in the spa resort in the totally refurbished art-nouveau Quellenhof Hotel. Despite huge protests, the rail link between Bad Wildungen and Korbach is closed. The rail links between Bad Wildungen and Kassel-Wilhelmshöhe station are improved as an alternative. Occupation of clinics declines severely as a result of the reforms in German health policy (the ‘Spa Crisis’). A business development organisation is founded in Bad Wildungen. Inauguration of ‘Europe’s largest spa park,’ which connects Bad Wildungen and Reinhardshausen (the ‘Forest and Health’ pilot project). A vehicle licensing centre opens in Bad Wildungen. The ‘living museum’ opens in the Odershausen district which exhibits village life in times gone by. The famous altarpiece is returned to the church after many years of painstaking restoration. The chapel itself is also refurbished. The government of the state of Hessen selects Bad Wildungen as the location for the 2006 State Garden Show. Germany’s highest high ropes course is installed in the spa park. The train station is converted to become a business start-up centre whilst maintaining its original function. The Academy for Information Technology is opened in the spa town. Bad Reinhardsquelle GmbH also comes under the control of the town of Bad Wildungen in June 2004. By the end of the year, the thermal springs are opened in Reinhardshausen after an extensive modernisation process. In April, the 3rd Hessian State Garden Show opens its gates in Bad Wildungen. By October, more than 440,000 people have visited this unique attraction. The ‘event of the century’ sees the enhancement and conversion of the park and meadow around the Königsquelle and the entire Bornebachtal. The charming Königsquellen Park, Schlossquelle, Springs Tunnel, Play Meadow and the Cabinet and Golden Gardens have had an enduring and charming influence which continues to enhance and enrich the town’s tourist infrastructure. There are many other projects with a local flavour throughout the town that are also well worth seeing.